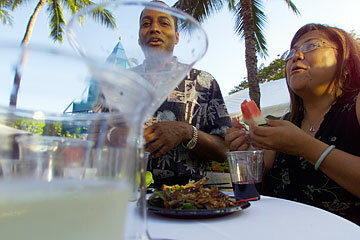 Ralph and Christina Fuller enjoyed drinks and dishes of gourmet food during Great Chefs Fight Hunger in May 2005. This year the fundraiser will be held March 24. Feed yourself and feed others by extension when you buy a ticket to the Great Chefs Fight Hunger fundraiser March 24. The food-tasting, featuring restaurants including d.k. Steak House, Alan Wong's, Roy's, Town, and Chai's Island Bistro, is a benefit for the Hawaii Foodbank. The wining-and-dining event takes place at 6 p.m. at the Foodbank's distribution center, 2611 Kilihau St., Mapunapuna. Cost is $85; or $110 for VIP early entry at 5 p.m. Policyholders with AIG, the event's sponsor, pay $75. Call 836-3600, ext. 244, or visit www.hawaiifoodbank.org.